Having Trouble Training Your Terrier? Not all dogs are as eager to listen to you as you may want. Corgi’s, Retrievers, and even Collies love to spend time with you and the family, whether it’s having fun or just walking through the park, and will readily respond to your calls. But a few breeds, mainly terriers, aren’t so easily coaxed into simply “hanging out” with you and your family. Such pups always want to “go, go, go” when it comes to having fun. These free-spirited pups tend to do things their own way. These terrier breeds come in all sizes and are renowned for their valiance and determination, along with their very yappy alert system, making them excellent protectors for your home. Full of energy, breeds like the Parson Russell, Skye, and the Scottish terriers can be hard to handle but also just as fun to play with. But terriers need excitement or they get bored quickly. And that is when life can become difficult for you and them. Originally, terrier pups were bred to hunt alone. Unlike retrievers and other breeds of herding dogs, terriers were raised to roam about loosely on their property, hunting small vermin like rats, skunks, and even foxes in order to keep the owner and their property safe. All of this was done with little to no instruction from their human companions, which tends to make many terriers independent in nature if left unguided. By nature, terriers are often very intolerant to cooperating with their owners, making them difficult students during training. If something shiny pops up or perhaps a cat scurries through the yard, you may lose all control of your pup as they break for the door in hopes of chasing down their “prey.” They may even knock you over in an attempt to be the first out the door. For those wondering, the reason for their “yappiness” is due to their instinctive nature to frighten and intimidate their prey from burrows and dens. In fact, the term “terrier” means “from the earth,” which is why many terrier breeds are renowned for their golf-course style backyard decorations. Digging and tunneling is a favorite activity for them, which on occasion makes them difficult to handle. The very nature of terrier breeds is why it’s so important to undertake training at an early age very seriously. Of importance to note is that terriers are extremely defiant and no level of negative punishment will convince them to listen to you. Punishment will only make them more hard-headed and less likely to want to be your friend. The goal is to make them want to hang out with you because it’s fun for them. Because of their very independent nature, when they’re young, socialization with both people and other animals is a must. It helps your terrier pup overcome their instinctive nature to roam and hunt alone. This is mainly because walks, though simple in nature, help develop a bond between the dog and the individual holding the other end of their leash. They’re more inclined to look to you, their owner and protector, for answers and instructions. The best thing you can do for a terrier breed is to make things entertaining. Having fun makes a huge difference to these pups, and if it isn’t exciting or enticing, they’ll want to move on or even ignore you. A handy trick to rely on is having a treat readily available to offer them when your terrier listens to your commands. Food is a good hand to play in this particular training scenario since terriers are often food-driven, mainly because it plays to their hunting instincts. So when it comes to training, the training plan for a terrier breed needs to not only be fun, but full of treats as well. You’ll also need to spend a lot of time socializing with them. While they do have a knack for entertaining themselves (checking inside the couch cushions and underneath the carpet), they’ll need to be kept entertained or they’ll start focusing their attention on less constructive things, such as landscaping your backyard for a good 18-hole game of golf. 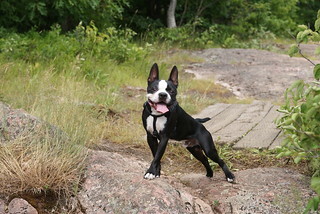 Regardless of obedience training, terrier breeds still need to be watched carefully, especially around dangerous situations such as busy roads and on camping trips (bring your leash and a good harness along). Instinct can still overcome any level of training, which can be dangerous for these pups in certain circumstances. Terriers are invaluable companions and valiant protectors, but they can also be a little hard-headed when it comes to listening to you. So be sure you take the time to develop a positive bond of companionship between you and your four-legged friend, or they might be the ones making the decisions around the house.